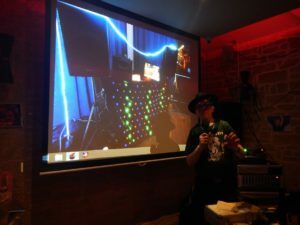 Below is a collection of written testimonials and feedback left for Mad Hatman Discos Edinburgh DJ by Function organisers, Hotel managers, Parents etc in venues in Scotland from Edinburgh, Lothians area. 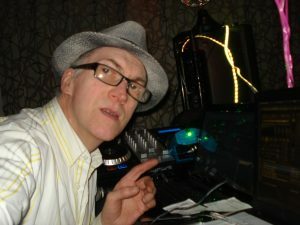 If you are looking for a DJ to look after your party or special event. 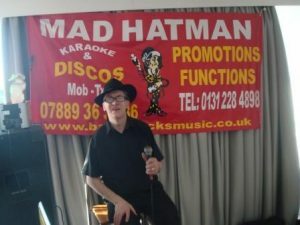 Check out what Mad Hatman DJ did to make weddings, Anniversaries, Kids parties, Charity events, Store promotions a success and give you confidence to book Hatman DJ and Karaoke host. Oct 2017 Portobello Masonic Club - Lothian Buses function - Good when music changed when no one was dancing. Good variation of music throughout the night Hatman DJ created good atmosphere. 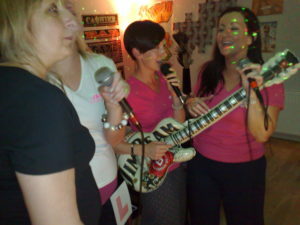 April 2015 "We all had a great time" writes party hostess Mrs Alex Gordon Edinburgh re 40th Birthday Disco. Oct Kings Buildings Function suite 21st Birthday disco - The Mad Hatman DJ is recommended for an amazing disco Elaine Muir Edin. Nice to get a repeat booking from a memorable gig almost 20 years ago. 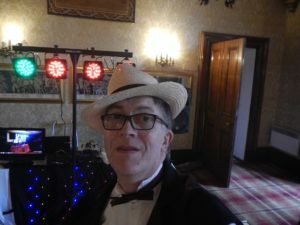 Out of the blue the lady asked if The Mad Hatter was still doing discos She remembered DISCO DJ wore HATS, was EXCELLENT + wanted the best to play for all ages at daughters 21st birthday party. 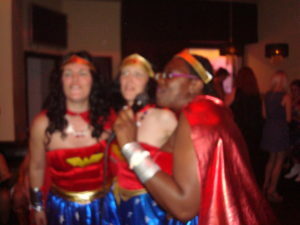 Jan 2010 St Giles Marchmont 15th Birthday disco Fancy Dress Great Night, good atmosphere, dancing and music selection I can recommend Mad Hatman disco dj Thanks Neil Mackay Edinburgh. Bruntsfield Hotel Sept 09- Nurses Retirement RIE - Mad Hatman discos were fantastic and are recommended "More, More of the same" Shona Davidson Edinburgh. 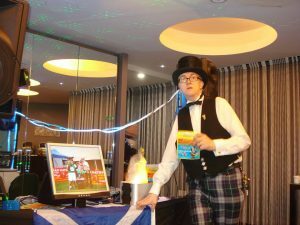 Grange Edinburgh Scotland : Booking confirmed for February 2009 Surprise 40th party in Edinburgh ,more DJ banter mentioned at 30th party with band and enjoyed by all > satisfied clients again 10 years later. MARRIOTT DALMAHOY HOTEL & COUNTRY CLUB - WEDDING RECEPTION - July 2007 Mad Hatman Discos dj played a good selection of music and everyone enjoyed the entertainment provided which I can recommend. Mrs Wilson brides Mother. April 2007 David LLoyds Sports Centre: Kids Party Mad Hatman Discos Dj played a good selection of music and will be recommended - Mrs Campbell sons 11th Birthday party. Holy Cross Church Hall: Edinburgh April 07 Child's 8th Birthday Disco - A quick note to recommend Mad Hatman Discos choice of good music at my daughters party and all action songs played motivated kids throughout. Mad Hatman Discos I am writing on behalf of the Bedrock Project to thank you very much indeed for providing a first class disco entertainment service for our function at the Pitz Portobello, Edinburgh on Saturday. We were pleased with the whole event and would recommend you to everyone. Mad Hatman Discos Edin Thanks for all the excellent organisation and hard work done by you at our wedding exhibition held at Royal Overseas House Princes St Edinburgh on 11th January. It might be worthwhile to consider another next year and we will be in touch. Great Scottish charity Walk John Clarke Quality Action Group : while I was in Edinburgh doing the great Scottish walk. I really enjoyed your music from The Mad Hatman Boogie bus. It was a great day out!